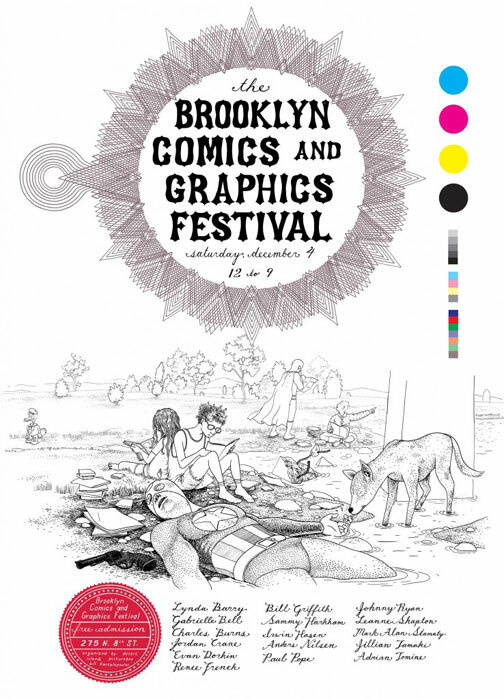 the 2nd annual BROOKLYN COMICS and GRAPHICS FESTIVAL is tomorrow. one day only !! see: THE BROOKLYN COMICS & GRAPHICS FESTIVAL WEBSITE for details, incl FEATURED GUESTS & PROGRAM of EVENTS !! THE FESTIVAL IS ORGANIZED BY: DESERT ISLAND, PICTUREBOX and BILL KARTALOPOULOS. CHARLES BURNS, who will debut his new book – Johnny 23.
and ANDERS NILSEN, who did this year’s poster. ERNIE BUSHMILLER’S iconic comic strip Nancy has been described as “a mini-algebra equation masquerading as a comic strip” drawn by “a moron on an acid trip.” BILL GRIFFITH (Zippy the Pinhead, MARK NEWGARDEN (How To Read Nancy), and JOHNNY RYAN (Angry Youth Comix) will discuss the unshakable appeal of Nancy and the essence of gag humor in their comics. Artwork that is dense with compositional detail, line, pattern, and texture encourages a lingering, wandering eye. How does this kind of drawing work in comics ? BRIAN CHIPPENDALE, JORDAN CRANE, KEITH JONES, and MARK ALAN STAMATY will consider the relationship between densely made drawing and the propulsive concerns of visual narrative.